In Australia where biomass resources are widely dispersed, the cost of collection and transporting biomass to central plants for processing is expensive. For biomass that is classified as an invasive species or biomass that has been infected by pathogenic micro-organisms, governments often forbid transportation for biosecurity reasons. Additionally, some governments prevent residue burning in rural areas, while others are introducing similar regulations. To better utilize biomass and residues while meeting local emissions regulations, Dr. Stephen Joseph looked into the viability of a small portable production unit that could convert both woody feedstock and crop residues into biochar for wide application in rural areas of both developed and developing countries. 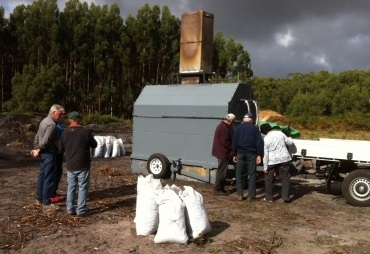 Dr. Joseph asked Mr. Russell Burnett of Biochar Energy Systems Pty to design and manufacture a small biochar production unit for initial testing at a biochar training workshop held in rural Victoria, Australia. The initial set of testing was successful (the emissions proved to be within the desired limit of less than 100ppm of carbon monoxide (CO) and nitrous oxide (NOx)). Mr. Burnett and Dr. Joseph then worked on a design that could produce approximately 100kg of biochar in 2 – 3 hours from a mixed feedstock. The unit is designed to be pulled around on farms, or from property to property, by either a small tractor or pick-up truck. The unit is constructed of a steel outer shell with over 150 mm of high temperature ceramic fiber insulation, secured by pins and mesh (310 Stainless Steel—a high heat grade). Internal air pipes and heat shields are also stainless steel (grade 253MA Stainless Steel—another high heat grade) to ensure a long service life. The feedstock crate is constructed from heavy gauge steel; this is the only steel that comes in contact with the biochar product. Stainless steel is not used in the feedstock crate due to the probability that chromium may leach into the biochar and potentially contaminate the product. To run the unit and produce biochar, the feedstock is placed into the 4m3 feed crate which rests on the ground with an open bottom. 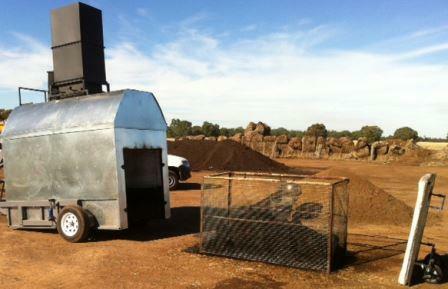 The pyrolysis unit is then moved over the crate, lowered, and the rear door is attached to seal the unit. 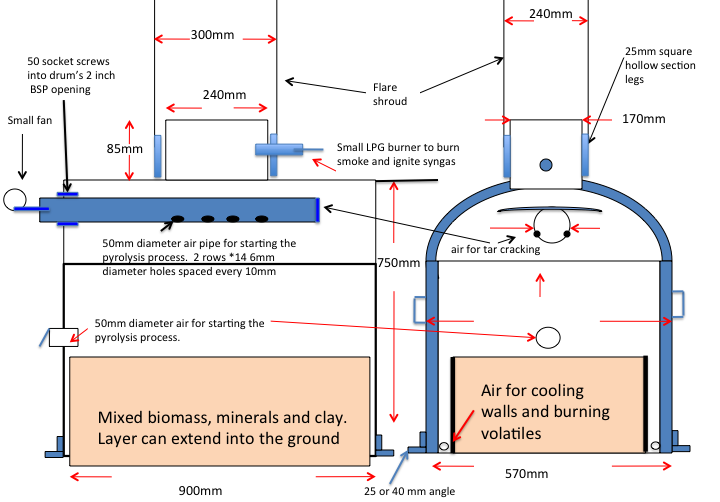 Using the inspection port situated at the top of the rear door, the feedstock is ignited and allowed to free burn until the top of the feedstock bed reaches a temperature of around 400C which takes 10 – 15 minutes. At that time, air is allowed to enter the chamber above and (to a lesser extent) to the side of the feedstock crate inside the unit. The volatile gases come off the pyrolyzing feedstock, mixing with the secondary air, and burn in the combustion zone at the top of the kiln, which allows the heat to radiate back down to maintain the pyrolysis reaction. A heat deflection shield situated in the upper combustion zone above the pyrolyzing feedstock increases the radiant heat effect. The temperature is maintained during the process using a combination of air control and side mounted water misting jets. Temperatures in the combustion zone can vary dependent on the feedstock. For cereal straw/poultry manure, 700 – 750C below and 820 – 870C above the heat shield maintains a pyrolysis temperature of ~500C. 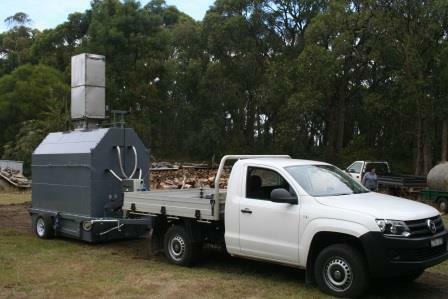 For a material such as eucalyptus wood, the same pyrolysis temperature can be maintained with much lower combustion zone temperatures; 550 – 580C below and 600 – 620C above the heat shield. The feedstock slowly pyrolyzes downwards over a period of 1.5 hours for cereal straw, and can take up to 4 hours for a woody material. Once the process is complete—when the material at the base of the feed crate reaches 400C—water is introduced through quenching jets situated at either end of the unit to reduce the biochar temperature below 90C. The rear door is then removed; the unit is raised and moved away, or moved to the next full feed crate for the process to start again. Using a combination of cereal straw and poultry litter, 3.5 to 4.5 m3 of nutrient rich biochar can be produced consistently over an eight hour working day. The developers conducted a series of emissions analyses using a Bacharach PC3 Flue Gas Analyzer. In the initial free burning stage where CO and NOx readings were 600 ppm and 160 ppm respectively, the unit quickly settled down to consistently run at between 60 – 90 ppm for CO, and 36 – 52 for NOx. The O2 reading was consistently 17.6%. Typically, wood fired combustion devices have CO emissions of 200 ppm and NOx emissions of 400 ppm and an O2 reading of 11%. The feedstock in this trial was one part poultry litter and four parts wheat straw with a biochar yield of 35%. Two reasons for the low emissions levels include the three stage gasification of the volatile syngases with controlled forced air above the feedstock in the combustion zone of the upper reactor chamber/kiln. Secondly, the use of water misting jets that introduce water droplets to vaporize into hydrogen and oxygen increase the calorific value of the syngas which leads to more complete combustion. Water misting jets are adjusted according to the temperature in the top of the kiln. A stationary version of this machine was built for the Amazonian Conservation Association, Peru. It has been operating since July 2014 to produce biochar for trials at a research station at Villa Carmen. For more information on this project, email Russell Burnett at rwgb@appliedgaia.com.